Marinating Meat: Mix together tamari, agave, mirin, ginger, garlic and white pepper in a small dish. Add chicken breast pieces marinating for four hours. You can also marinate it overnight if you have the time. Directions: Soak the bamboo skewers in water for 10 minutes. Heat grill to 400 º F on medium-high. Skewer chicken. Place skewers on grill and cook for 2 minutes. 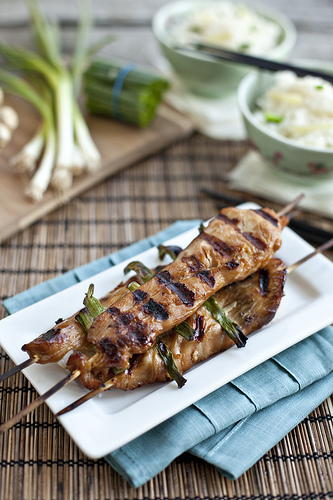 Flip skewers and baste with leftover marinade, grilling for 1-2 minutes more. Flip and continue until chicken is cooked through and chicken juice runs clear. Cooking time should be 6-8 minutes, but will depend on the thickness of your chicken pieces. Remove chicken from grill and allow to rest before serving. These grilled skewers go great with pineapple and grilled vegetables. Makes a delicious lunch or dinner. Our families favorite is the chicken served with rice pilaf, grilled veggies & fresh pineapple. The kids love it and adults too. Makes a perfect meal for all to enjoy. Thank you so much for visiting us. We sure appreciate your support and kindness. Wishing you great love, health, and abundant happiness this day and always!